It’s never usually a planned event. It is always most unpleasant when it does occur. Even if minimized, no RV is ever immune from it. Sometimes the result of it can be costly. It most assuredly will not enhance an otherwise enjoyable vacation or excursion. Other variations of it may be equally unpleasant, yet not as debilitating. No, this one is different. So what is the “IT” I’m rambling about, you ask? It’s propane system failure. Even when one considers legitimate appliance options such as the microwave oven, portable space heaters, the electric portion of the refrigerator and the electric element in some water heaters, being without propane is indeed a handicap. Try starting your LP generator without it. Still, you ask, if I’m held up on my trip because of a slipping transmission or an engine problem, I’m still held up. True, but consider this also – the worst case scenario of a transmission or engine-caused delay results in loss of time and certainly money. One shudders as you ponder the worst case scenario of a failed propane system. But wait a minute. Didn’t the dealer check everything out? I’ve had this coach five years now and everything is still working fine. True, everything may be fine and yes, more than likely, your dealer did do all he could do to prep your coach before you took delivery, but remember, all propane-burning appliances need periodic maintenance, as does the gas system in general. Whether attributed to use, abuse, or non-use, the fact remains that some propane components simply need attention from time to time. We can choose, however, to spend our money paying for far costlier crisis repairs by waiting until a component fails, or we can opt for putting into practice a little preventive maintenance. The focus of this commentary will be on the propane system in general. It will interest most all sincere RVers and it will be especially important to you full-timers or those of you predisposed to dry camping. I hope it illuminates the importance of preventive maintenance as it relates to the propane system. Let’s take a look at why, beginning with a detailed look at the main propane pressure regulator. 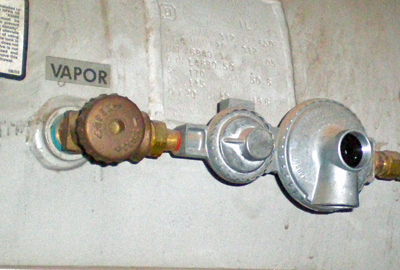 The propane pressure regulator is considered by many to be the heart of the propane system. 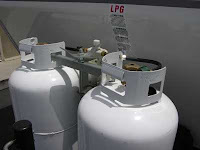 The propane container(s), the appliances and the connecting piping and tubing and hoses, plus perhaps a method of switching between two cylinders make up the rest of the system. You may even have an LP-fired generator on-board. Positioned directly at that allegorical center, however, is the pressure regulator. In order to appreciate the importance of propane system maintenance, one must truly understand the inner workings of the pressure regulator. Probably the hardest working single component found on the RV, the task of the regulator is appropriately self-descriptive. It must keep up with fluctuating internal propane container pressures, then regulate and deliver a nice smooth, even flow of gas to each of the appliances. And it must do this continually whenever the main service valve is open. If it stumbles or skips a beat, internal damage to delicate components found on some appliances could result. Truly the heart of the system; and a relatively inexpensive component as well. 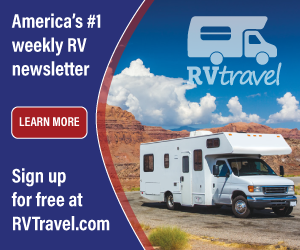 Being affordable, it is highly suggested that all RVers carry a spare regulator whenever and wherever they travel. In the event of regulator failure, in most cases, replacement is mandatory. So what makes the propane regulator such a workhorse? Here’s what happens inside the regulator when you open the service valve on the container. The fuel vaporizes immediately and enters the first of two stages (#5 above). In this first stage, the incoming container pressure is reduced to approximately 10-15 pounds per square inch, (PSI). The actual pressure inside the container will vary depending on the amount of fuel in the container, the temperature and a few other factors, but suffice it to say that it may be quite high; upwards of 250 PSI or greater. Not only is the pressure high, but it is also fairly unstable, fluctuating up and down as factoring conditions, such as temperature, change. Remember that there is no pressure regulation going on inside the propane cylinder or tank, simply containment. It’s also important to note that we store propane as a liquid, yet use it at the appliances as a vapor. But let’s continue. Attached to the spring/ diaphragm connection is a mechanical pivot and arm (#6) that is connected to a seat assembly and the first stage orifice. As the diaphragm moves against the spring when the fuel enters, the pivoting arm moves the seat closer to the orifice, impeding the flow of fuel. Fuel then enters a second chamber below a rubber diaphragm (#2) that is held steady by the opposing force of another coiled spring positioned above it (#1). As the fuel is fed into the 2nd stage chamber, the diaphragm is expanded and pushed up against the opposing strength of the coil spring, compressing it. An equivalent here would be like trying to blow up a child’s balloon inside a shoebox. The sides of the box would give way to the expanding balloon until the strength of the box sides can overcome the pressure inside the balloon. On two stage regulators, this first stage is pre-set to approximately 10-15 PSI; a setting that is non-adjustable. However, as the fuel passes through the first stage orifice of the regulator and enters the second stage chamber, regulation takes on a more definitive approach. 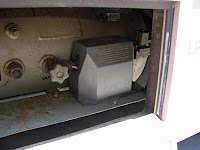 For years the four LP burning appliances found on typical RVs have been designed and manufactured to operate with a delivery pressure of between 10 and 14 water column inches. For optimum appliance operation, therefore, the operating line pressure is set at 11.0 inches of water column, which falls about in the middle when lock-up pressure is factored in. From this stage on, think of pressure in terms of water column inches instead of pounds per square inch. A water column inch is a much smaller unit of measurement used to measure the rather slight propane operating line pressure. I always use the analogy that it would be like measuring distance in either miles or inches. Each would be true and accurate, but the inch measurement would be more finite. For vapor pressure measurements, eleven inches of water column, (11” W.C.), is the equivalent of only four-tenths of one PSI, (.4 PSI)! In the second stage of a typical two-stage regulator, much the same mechanical action and reaction takes place between the diaphragm, a pivoting linkage (#6) and a coiled spring as in the first stage. The main difference here is that the orifice opening is much smaller, (more restricting), which reduces the incoming 10 PSI from the first stage to the correct operating pressure of 11” W.C. Also, the spring tension on the second stage is adjustable so finite pressure adjustments can be made. 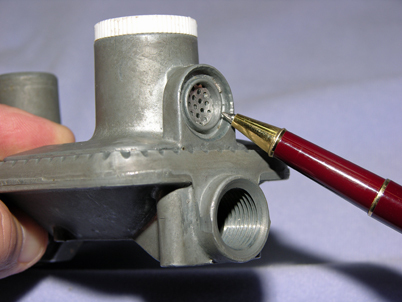 The second stage adjustment point is positioned under a protective dust cap on the regulator. 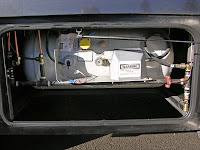 When no burners are lit in the RV and therefore, no need for fuel to be flowing, the second stage orifice will be shut off completely, effectively stopping the flow of fuel inside the regulator. At this juncture, the spring tension has overcome the pressure exerted against the diaphragm by the incoming gas. Such is the case in the diagram above; both orifices are closed. This is called regulator lock-up. Measuring the lock-up pressure is an important test that needs to be performed at least once per year or whenever the pressure is adjusted. But when a burner is lit anywhere in the system, the drop in pressure inside the regulator body allows the springs to push the diaphragm back down. This movement will allow the linkage to move the seat away from the orifices in each stage, which allows more fuel to enter the regulator. As more fuel enters, the incoming gas pressure once again overcomes the spring strength and the orifice is again impeded by the seat. As more fuel is consumed at a burner, the pressure drops inside the regulator once again, and (pause), I think you get the picture, the cycle simply continues. Therefore, the bottom line is this; regulator operation is basically a balance between the strength of the springs and the flexibility of the diaphragm as fuel constantly enters and exits the regulator body. An exact gas pressure setting is attainable because the second-stage spring strength is adjustable. 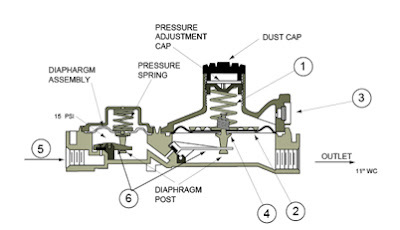 An important fact to understand about the regulator is that it must be able to “breathe” as the diaphragm expands and contracts inside the regulator body. That is, as fuel enters, the diaphragm expands slightly into an upper chamber above the diaphragm. These upper chambers are exposed to the outside atmosphere through a vent in each stage. If the upper diaphragm chambers were not vented allowing air to be expelled as it flexes, the diaphragm would simply not be able to move. Here’s the key; the vent openings for each stage must be kept clean and free from moisture, dirt, mud, snow or any other type of muck that may plug or block them. This is equally crucial for both the first and second stages. 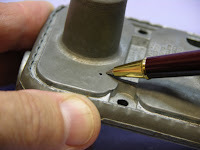 Typically the 1st stage vent is a fairly tiny hole in the regulator housing (see photo). It doesn’t take much to plug it. Likewise the vent portion of the second stage, though more prominent, is also critical for proper operation and must be kept clean. In fact, it is a mandate that the vent portion of the second stage always be positioned downward, (within 45 degrees of vertical). This position minimizes the possibility of dirt or mud collecting directly onto the vent screen. If a spare regulator is purchased, be sure the vent configuration is correct for your application. Most importantly, always keep your regulator covered with a plastic cover. All RVs will come with a protective plastic covering of some type surrounding the main regulator. This is the single-most effective method of protecting the regulator so always replace broken or missing covers as soon as possible. Okay so I have an idea now of what goes on inside the regulator, but whenever I turn the adjustment screw on the regulator, I see no difference in any of the burner flames I check. STOP! Major rule number two! Never attempt to adjust the propane regulator yourself! Only permit a certified or master certified RV service technician to adjust the propane pressure regulator! It mandates the use of special measuring devices. Pro technicians are trained to conduct a few other tests to the propane system as well, including a regulator lock-up test and a timed drop pressure leak test. Okay, but if that’s major rule number two, what’s number one? Never compromise the safety factor. Like electricity, propane must be respected. In order to be respected, it must be understood. In order to be understood it must be studied. But here’s what you can do in the meantime to ensure you avoid any propane system pitfalls. First and foremost, have the regulator tested and adjusted at least once each year. This means take your RV to a qualified RV repair facility; one that employs certified RV service technicians. Secondly, have your RV leak tested often. How often? At the very least, once at the start of your camping season, plus any time the system is opened, such as when loosening any fitting or removing an appliance. And most importantly, whenever you suspect a leak anywhere in the system! An odorant called ethyl mercaptan is injected into the inherently odorless propane during the distilling process. If you ever smell the presence of this odorant, immediately shut off the gas supply at the container and call your local service shop for an appointment. Since the propane regulator works so hard keeping your appliances fed a nice, healthy flow of gas, be nice to it. Keep it clean and out of the weather by checking the plastic cover. Have it set to the correct operating pressure at least once a year. Be sure the vent portion is pointed downward. Leak test the complete system often. You cannot be too safe when it comes to the integrity of the propane system! Have the LP fired appliances cleaned and checked annually. Carry a spare regulator with you as you travel. Replacement regulators are pre-set at the factory to approximately 11 water column inches so no adjustment will be necessary until after your trip. And the good news is that it cannot be installed incorrectly. The inlet and outlet are different sizes. Simply use the proper thread sealant (one approved for propane gas), and install the fittings at each end just as they appear now on your current regulator. Having that spare regulator in your spare parts kit will ensure you will not be left out in the cold, or without hot water, or refrigeration! And remember, RVing is more than a hobby, it’s a lifestyle!